So I've been on a little hiatus the past two months. Sorry about that guys! I've recently left my full time job and I've been able to focus on my family and my passions a whole lot more so I am excited to share with you what my brownies are doing this year! Who doesn't love an emoji? 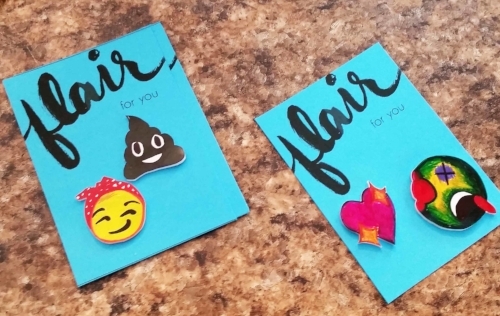 My daughter absolutely loved when we made emoji pins as xmas presents last year so I knew turning them into a swap would be fun. We did this as part of the Making Friends badge. Girls made two, one for themselves and one to share with a friend! First, you will need to make your emoji charm. If you want to make the swap, make sure you punch a hole in the top BEFORE you bake them!!!!!! Step 1: Find images off of the web and copy them into a word document. I recommend 6 images per page, like the image below. Print out your sheet. Step 2: Place shrink film over your paper and trace the images with your sharpie. Fill in with color. Step 3: Next, cut out your images. If you are making a pin your can move on to the next step. If you are making a charm make sure to punch a hold in your charm before you put it in the oven. This will leave a big enough hole to make a charm. Step 4: Place on a baking sheet and put in the oven for 1-2 minutes. The packaging of your shrink film should have a recommended temperature to set the oven to. Once they have shrunk, take them out and put them on a cool surface. Cover with a paper towel and press down to flatten any edges that curled up. Step 1: Warm up your hot glue gun. Step 2: Put a dab of hot glue on the back of your charm (the one sans the hole punch) and glue the tie tacks to the back. Step 3: allow to cool and SHARE! Step 1: Pick out two pony beads and string one on a safety pin. Step 2: Take your hole punched emoji charm and string through the safety pin. Step 3: Take your other pony bead and string through the safety pin and close the pin. Your Done! It's so easy and the girls loved these! I had each girl make two, one for themselves and one to share! Another fun idea.... use the charms to make a Girl Scout charm bracelet!! Posted on November 3, 2016 by Katie D. and filed under Girl scouts and tagged brownies swaps emoji making friends kids crafts Brownie badges.